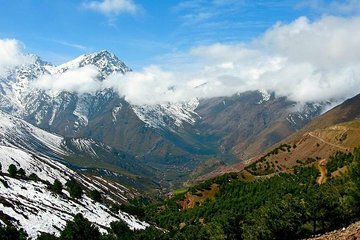 Évadez-vous de la ville animée et de la chaleur estivale lors d'une excursion d'une journée dans 4 vallées pittoresques nichées dans les montagnes de l'Atlas. Accédez facilement à des sites éloignés via un véhicule climatisé et explorez les paysages et les villages de la région lors d'une randonnée pédestre incluse. Savourez un déjeuner traditionnel tout en admirant une vue imprenable sur les montagnes enneigées et détendez-vous après une journée bien remplie grâce au transfert aller-retour depuis votre hôtel. The guide was on time in our hotel for our pickup. After a ride of one hour we arrived in the first valley. The scenery is very beautiful and the snowy mountains is a treat! We had also a camel ride short but nice due to the scenery. After this we drove to the next valley where we went for a trail with another guide. Hassan our driver and guide was really good and attentive. As he heard that it was my birthday and the birthday of my daughter the day before he prepared a surprise. After a two hour trail in the mountains fantastic he prepared a small picnick with a cake with both my name and my daughter on it :-. Together with a very nice gift for my and my daughter and the right music we celebrated our birthday in the mountains! Fantastic and really sweet of Hasan!! After this short brake we went to a berber family and had a great meal! We also visited a Argan oil cooperative where a nice lady explained how it was produced and which products you can make. There we had also a nice small meal tea and bread with oil. After visiting the other valley we drove back to our Riad in Marrakech with a very nice experience! Recommended.